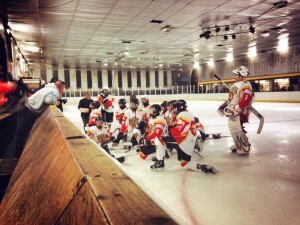 On Saturday 8th February 2014, at Bradford Ice Arena the Bulldogs faced Grimsby. They arrived with a depleted team as their U16 had a game of their own. Grimsby are at the lower end of the table so the Bulldogs were looking for another win to add to their winning streak. The first period started with strong attack from the Bulldogs, and at 1:12 the puck was in the back of the net for Bradford an even handed goal scored by Max Broadhurst, assisted by Connor Parkin. A frustrated Grimsby began to retaliate and a penalty at 2:44 for Samuel Coombs for interference. During the power play, Ryan Kemp received the puck from Hannah Gibson and scored goal number two. 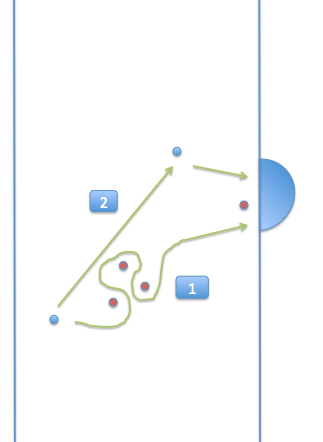 At 8:14 Ryan again took the puck, passed by James Royds and scored goal number three. The Grimsby net minder was all over the place and seemed to need a sticky pad to keep his stick in his hand, it spent more time on the floor than in his grip! At 10:25 Max found the back of the net with goal number four assisted by Josh Richardson, and again a few seconds later scored his hat trick goal at 10:44 assisted by Abbie Culshaw. Less than a minute later goal number six was scored again by Connor, assisted by Max. The Grimsby players weren’t at all happy with this shower of goals and seemed to take it out on the female players Aimee and Hannah, but both girls recovered quickly. At 13:28 John Holland sat two minutes for roughing and then whilst on the power play Adam Barnes scored goal number 7 for Bradford. At 19:31 Grimsby took a further penalty from Kieran Hagger for tripping. End of period score 7 0 to the Bulldogs. The second period started with a hat trick goal from Ryan at 21:06; assisted by James Royds, and then a fourth at 23:26 assisted by Lewis Baldwin. At 24:17 Bradford received it’s first 2 minute penalty from Josh Birtwistle for charging. But even shorthanded the Redwings couldn’t break the defence, with some fantastic saves from the Bulldogs netminder Andy Button. But after a full thirteen minutes of no goals and no penalties, Bradford were caught off the hop, and Grimsby got their first goal at 37:23 scored by Gareth Pirie, assisted by Samel Tyson, as it passed Andy’s reach. At 39:37 again Max scored his fourth goal, assists from Connor and Danny Spence. End of period score 10 1 to the Bulldogs. The final period saw the four England players sitting out, in preparation for the away game at Grimsby. The lines were changed to see how we fared without them. Well Grimsby took this opportunity and scored their second goal at 42:51 from Kieran Hagger, assisted by Sam Tyson. Both teams held their own until 51:30 where Josh Richardson scored his first goal of the game assisted by Danny. With the England players back on Max received a two minute penalty for roughing at 53:20. Grimsby were the next in the box with a two minute sit for the net minder who tripped Danny Spence as he shot for a goal at 59:35. 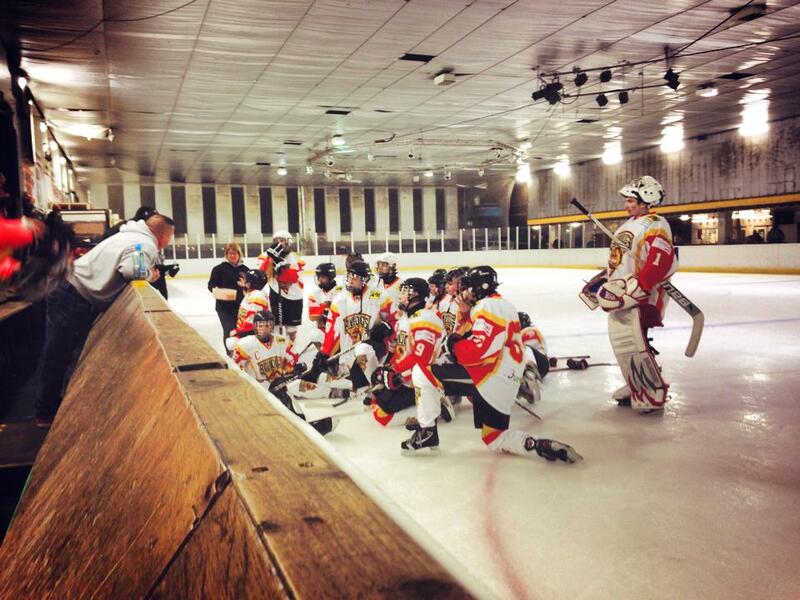 Final score 11 – 2 to the Bulldogs, well done once again U18’s another two points nearer the top of the league.